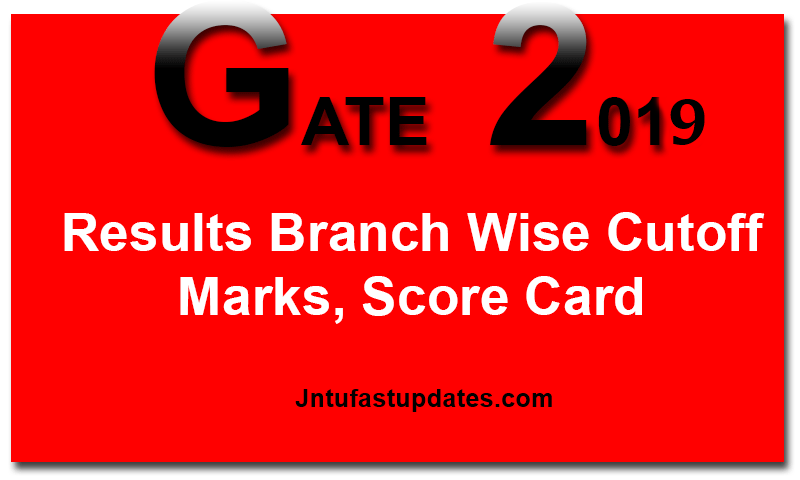 GATE Results 2019 – GATE Exam Result 2019 released with Branch wise cut off marks. Students should find gate result branch wise for CSE, ECE, Mech, Civil, eee etc in the official Website appsgate.iitm.ac.in. Candidates can use GATE 2019 Login (GOAPS) to know the result, marks, branch wise cutoff marks on 16th March 2019. GATE Results 2019: Gate 2019 Exam Was Conducted in the Month of February 2nd, 3rd, 9th, 10th in Different Exam Centers Across India. Nearly 2 Lakh People Was Attempted the GATE 2019 Exam For getting Admission in the M.TECH IIT Colleges across india. So, GATE 2019 Answer Key also released for checking GATE 2019 answers for Calculation of expecting Marks. Lakhs of aspirants have competed for GATE examination 2019 in the month of February. All the hopefuls can get the GATE Scorecard and result 2019 soon at GATE official website, gate.iitg.ac.in. Annually the GATE examination will be conducted by IITs. This year IIT gauhathi has taken the responsibility to conduct the GATE examination for aspirants across India. The GATE 2019 has been conducted on 2nd, 3rd, 9th, 10th February 2019 respectively. Many of the hopefuls interested to get admission in National Level colleges compete for GATE examination. The GATE examination will be held for 23 different papers like Civil, Mechanical, Computers, IT and various other branches. Candidates compete in lakhs for GATE examination annually. Graduate Aptitude Test in Engineering (GATE) is a national level examination that tests the comprehensive understanding of the candidates in various undergraduate subjects in Engineering/Technology/Architecture and post-graduate level subjects in Science. The GATE score is used for admissions to post-graduate programs (e.g, M.E., M.Tech., direct Ph.D.) in Indian institutes of higher education with financial assistance provided by MHRD and other Government agencies. How To Download GATE Result 2019 With Score Card online? Use of GATE 2019 Score Card: The GATE 2019 score used many Public Sector Undertakings (PSUs) for employment screening purposes. The Indian Institute of Science (IISc) and seven Indian Institutes of Technology (IITs at Bombay, Delhi, Guwahati, Kanpur, Kharagpur, Madras and Roorkee) jointly administer the conduct of GATE. GATE 2019 Score Card is Valid for 3 years from the Announcement of Result Date. The candidates need to apply separately to each of the IITs, IISc, NITs and other institutes/universities to seek admission to various post-graduate and doctoral programmes. The candidates have to visit the websites of the respective institutes/universities for details regarding the admission. Civil, CSE, ECE, EEE, IT, Mechanical, Biotechnology, Chemical Engineering, Geology and Geophysics, Mining Engineering, Physics, Petroleum other branches Graduate Aptitude Test in Engineering (GATE) Result, score card Will be Available here. GOAPS: http://appsgate.iitm.ac.in is the web page/web address of the GATE Online Application Processing System (GOAPS). It can also be accessed from the GATE 2019 website (http://www.gate.iitm.ac.in). GATE Result 2019, Scorecard & All India rank Card download options are Available Now. The marks and score provided here are for information only. An electronic or paper copy of this document is not valid for admission. For the papers CE and ME, qualifying marks and score are based on “Normalized Marks”. How to Get/ Download GATE 2019 Result and Score Card PDF with marks? Enter the details of Enrollment ID/Email Address, password, capcha code and click on ‘Submit’ button. Then, it will navigate to your account. Click on the ‘Download GATE 2019 score card’ link. The GATE Results 2019 and All india Rank Card appears on screen. 1.4 How to Get/ Download GATE 2019 Result and Score Card PDF with marks? How can i get score card of gate 2018 examination, where i missed last date of (march 2018) examination. please reply..